It’s the first week of February and pouring rain in the Bay Area, but NPB spring training camps are kicking into full gear. Here are some news and notes from around the league. All of the below articles are in Japanese. Let the wear and tear begin: new Chiba Lotte Marine Takumi Nasuno threw a 300 pitch bullpen session the other day, bringing his total for the four days he’s spent in camp to 646. In what Sponichi referred to as “Bobby-free” Lotte had six pitchers throw over 200 pitches on Feb 5. The article explains that this was in contrast to Bobby Valentine’s practice of limited bullpen sessions to 20 minutes at a time. I have to question the wisdom of working pitchers like that this early in camp, after several years of getting more rest under Valentine. Chiba Lotte also signed former Hanshin infielder Makoto Imaoka after a brief trial in camp. Imaoka gets a 15m yen salary for 2010. Having so far failed to attract any offers, 38 year-old infielder Toshihisa Nishi is planning on working out in front of MLB scouts in the near future. Chunichi rookie Ryoji Nakata, who was already chunky at 115 kg, has put on 3 kg since getting into camp. Here’s a video interview with Yusei Kikuchi, who is now professionally known simply as Yusei. 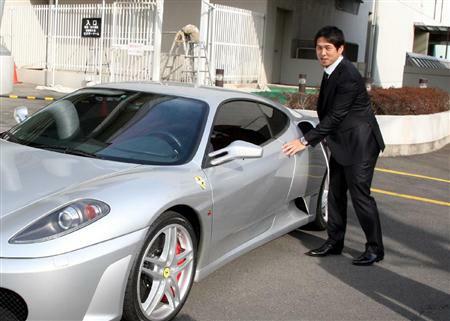 Kyuji Fujikawa has finally signed for 2010, getting a 400m yen salary. Kyuji paid his own way ｔhrough camp up to this point. And finally, Brandon Siefken of Japan Baseball News is kicking off a monthly newsletter in April. Each month’s issue will include a spreadsheet of statistical data. You can get the full details here and subscribe here. Yu Darvish has signed his 2010 contract. In 2009, the heralded righty went 15-5 with a 1.73 era over 182 innings, taking home the MVP award at the end of the season. In return, the Nippon Ham corporation is bumping his salary up 60m yen ($678k in the currently weak US currency) to 330m yen ($3.729m). Darvish bumps Hisashi Iwakuma from the top spot as the highest paid pitcher in the Pacific League, though he’ll still trail Central Leaguers Kyuji Fujikawa and Hitoki Iwase for the overall lead. Darvish also crosses the 300m yen mark at a younger age (age 24 season) than any other player in NPB history, though Ichiro took home over 400m yen at age 25. That he’s aiming for a comeback is true. Because he’s gotten back into shape*, he came to want play again. He’s playing with a cheerful demeanor. He wants to get tryouts and find a club he can play for. He’s looking to make a comeback in the independent leagues during the season. Looking to the future, the thinking is that if possible he wants to return to a high level, like MLB or NPB. *the original Japanese translates more directly as “his condition has returned”, which I think is really more of an assertion that Irabu has recovered from the injuries that forced him to retire. Keep in mind that this is a guy who was known as “jellyfish” in Japan before he was ever called a toad. The jellyfish moniker was an affectionate one though. I wonder if that’s Don Nomura talking. Nikkan Sports provides us with a picture of him throwing, but I think that it was taken before the WBC, when Kyuji Fujikawa was working out in LA and happened to bump into Irabu in Compton. That sounds too ridiculous to be true, but it’s what was reported. Irabu is a US green card holder and returned to the US earlier in the year. Putting two and two together, I’d say he’s looking for a spot in the Golden League.